Ogunjobi did not suffer a concussion and was cleared to return to Sunday's loss to the Ravens, Nate Ulrich of the Akron Beacon Journal reports. Analysis: Ogunjobi exited during the second half to be evaluated for a concussion but thankfully was able to avoid the concussion protocol. The 24-year-old also dealt with a biceps injury earlier this month but played in all 16 games for the season. Ogunjobi exited Sunday's game against the Ravens and is being evaluated for a concussion, Mary Kay Cabot of The Cleveland Plain Dealer reports. Analysis: Ogunjobi has not yet entered the league-mandated concussion protocol, and still has a chance to return to Sunday's season finale. Brian Price is expected to slot into the starting lineup as long as Ogunjobi remains sidelined. Ogunjobi recorded four tackles (all solo), including a sack, in Sunday's win over the Bengals. Analysis: Ogunjobi has continued his impressive second season. He's up to 49 tackles (32 solo), including 5.5 sacks, through 15 games. He'll look to finish off the season strong against the Ravens in Week 17. Ogunjobi (biceps) is active Sunday against the Bengals. Analysis: Ogunjobi has yet to miss a game all season, and he won't let Week 16 be his first time on the sidelines. He went through a similar practice routine last week with back-to-back limited sessions before ultimately suiting up, suggesting he would be in line to resume his regular role as a starting defensive tackle. With Carl Davis (coach's decision) inactive for the contest, Ogunjobi will be part of a three-man DT rotation that also includes Trevon Coley and Brian Price. Ogunjobi (biceps) is questionable for Sunday's game against the Bengals, Nate Ulrich of the Akron Beacon Journal reports. Analysis: Ogunjobi has been questionable each of the last two weeks but has played through his biceps injury, and that appears likely to happen again in Week 16. Should the 24-year-old suffer a setback, Brian Price would likely benefit from increased snaps at defensive tackle. Ogunjobi (biceps) is active for Saturday's game against the Broncos. Analysis: Ogunjobi was listed as questionable but will once again attempt to play through the biceps injury. The 24-year-old should take up his usual starting role in Denver on Saturday. Ogunjobi (biceps) is officially listed as questionable for Saturday's game against the Broncos, Nate Ulrich of the Akron Beacon Journal reports. Analysis: Ogunjobi was able to play through his biceps issue during Sunday's win over the Panthers, and he was a limited participant in practice Wednesday and Thursday. If the second-year linebacker were to ultimately sit out against the Broncos, expect Carl Davis to slot into the starting lineup. 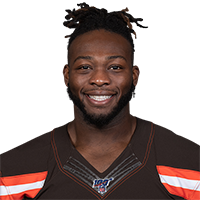 Ogunjobi (biceps) relayed Thursday that he will be a game-time decision for Sunday's contest against the Panthers, Nate Ulrich of the Akron Beacon Journal reports. Analysis: When asked whether he would suit up Week 14, Ogunjobi said "Well, that's always what I think, but I've still got to see what the coaches and the trainers [say]." The second-year defensive tackle underwent an MRI on his biceps injury Wednesday, the details of which remain undisclosed. Expect the Browns to list Ogunjobi as questionable for the contest, with final word on his status becoming apparent when the team releases its inactive list 90 minutes prior to Sunday's 1 p.m. EST kickoff. Ogunjobi (biceps) underwent an MRI on his biceps Wednesday, Mary Kay Cabot of The Cleveland Plain Dealer reports. Analysis: Ogunjobi suffered a biceps injury during a Week 13 loss to the Texans, and is now awaiting MRI results which will inform him of the injury's severity. Expect an update on Ogunjobi's health, along with his chances of suiting up against the Panthers on Sunday, in the near future. Ogunjobi said Monday that he doesn't think his biceps injury is serious, Mary Kay Cabot of The Cleveland Plain Dealer reports. Analysis: Ogunjobi also expressed optimism about his chances of suiting up against the Panthers in Week 14. Wednesday's first injury report of the week will shed some light on the second-year defensive tackle's chances of taking the field versus the Panthers. Ogunjobi is ruled out to return to Sunday's game against the Texans due to a biceps injury, Nate Ulrich of the Akron Beacon Journal reports. Analysis: With Carl Davis (coach's decision) inactive Sunday, expect Brian Price, Chris Smith and Anthony Zettel to receive increased defensive snaps as long as Ogunjobi remains sidelined. Ogunjobi recorded four tackles and half of a sack during Sunday's win over the Falcons. 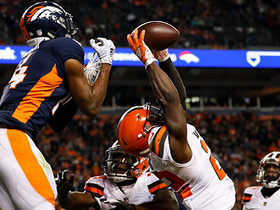 Analysis: Ogunjobi continues to see the heaviest workload among all defensive tackles in the league (699 snaps in 2018) -- and second among all defensive linemen to none other than Browns defensive end Myles Garrett (723). It's fair to wonder whether the wear and tear they're accumulating will affect them in any way down the stretch as a result, but Ogunjobi isn't in the IDP discussion anyway given his gap-clogging role in Cleveland's defensive scheme. Ogunjobi recorded two tackles (both solo) in Sunday's loss to Kansas City. Analysis: Ogunjobi has been far from prolific the past few weeks. He's averaging just two tackles per outing the last five games, adding on a sack through that span. He has little value in most IDP formats. Ogunjobi notched eight tackles (four solo) during Thursday's 21-17 win over the Jets. 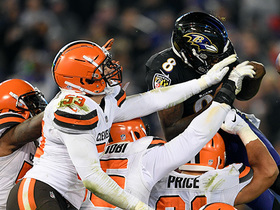 Analysis: Ogunjobi was held without a sack after taking down the quarterback in each of Cleveland's first two games, but nonetheless logged a strong effort. The 24-year-old has proven a key member of the Browns' stout defensive front line, and will attempt to maintain his production against Oakland in Week 4. Ogunjobi notched four tackles to go along with two sacks during Sunday's 21-18 loss to the Saints. Analysis: Ogunjobi has taken down the quarterback in each of the team's first two games, giving the 6-3, 305-pound defensive tackle three sacks on the year. He, along with Myles Garrett on the end, have helped turn the Browns' defensive front line into a formidable opponent. Ogunjobi notched seven tackles and a sack in Sunday's 21-21 tie with the Steelers. Analysis: Ogunjobi fared well in a tough matchup with two-time first-team All-Pro center Maurkice Pouncey and ultimately finished just one tackle shy of the team lead. However, it may be hard for him to sustain this level of production in Week 2 in a similarly difficult matchup with Saints' center Max Unger. Ogunjobi recorded one tackle and one fumble recovery during last Thursday's preseason game against the Eagles. Analysis: Ogunjobi started at defensive tackle alongside Jamie Meder, looking well past the shoulder injury he sustained in practice earlier in the week. However, Traveon Coley didn't play, and it's not certain that Ogunjobi will remain with the first unit when the regular season rolls around. Browns coach Hugh Jackson relayed Saturday that Ogunjobi is dealing with a shoulder issue, but he should return to the fold soon, Mary Kay Cabot of The Cleveland Plain Dealer reports. Analysis: Ogunjobi is aiming to follow up his 32-tackle rookie campaign with another season of contributions along the defensive line, so it would benefit him to retake the field in short order. Ogunjobi (groin) was a full participant in Wednesday's practice, Nate Ulrich of the Akron Beacon-Journal reports. Analysis: Ogunjobi didn't appear in either of the Browns' last two games due to an unspecified groin injury. His full participation Wednesday suggests he's on track to make a return during Sunday's matchup with the Jaguars. Ogunjobi (groin) is inactive for Sunday's game against the Lions. Analysis: Ogunjobi was unable to return to full strength during the Browns' bye week, so he'll miss his second consecutive tilt due to the groin injury. Danny Shelton and Trevon Coley figure to assume their starting roles at defensive tackle once again. Ogunjobi (groin) is listed as questionable for Sunday's matchup with the Lions. Analysis: Ogunjobi missed Cleveland's Week 8 game versus the Vikings, and even with the bye week, his groin still seems to be an issue. He practiced on a limited basis throughout the week and will most likely be a game-time decision. The rookie has 12 tackles on the season in a backup role. Cleveland Browns defensive back Jabrill Peppers makes a toe-tap interception in his own end zone. 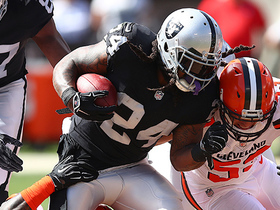 Oakland Raiders running back Marshawn Lynch refuses to go down on a 17-yard pass from quarterback Derek Carr. 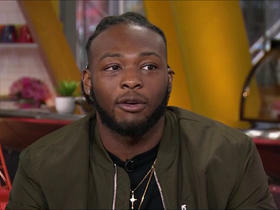 Browns defensive tackle Larry Ogunjobi talks about how the team will prepare and focus for training camp and appearing on "Hard Knocks." 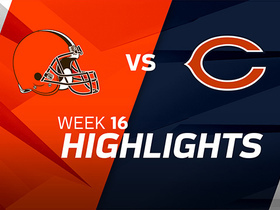 Watch the best plays from the week 16 matchup between the Cleveland Browns and Chicago Bears.